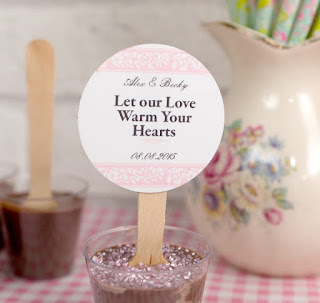 Today I have a really nice project for you, using our printed 2" circle tags, with melted chocolate, and finished with grosgrain ribbon. 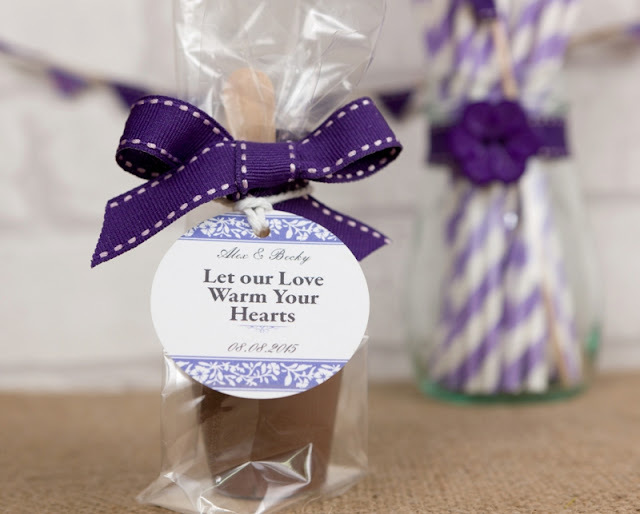 They make really nice favours for your wedding guests. Start off with some clear shot glasses. Ours were purchased on ebay, and are the disposable ones. Melt some good quality cooking chocolate over a pan of boiling water, or in a microwave. You can add flavourings at this stage if preferred. 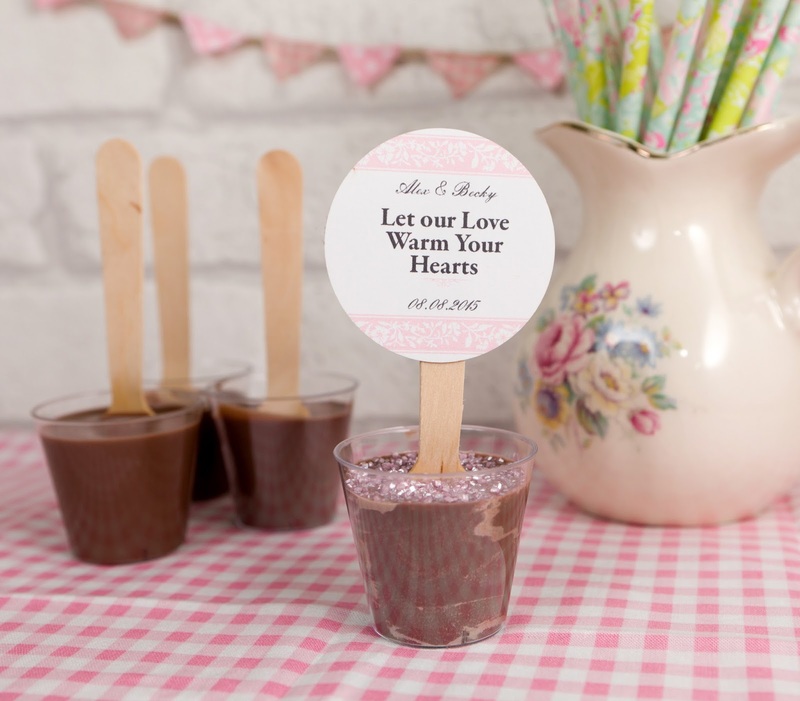 Pour the hot chocolate into the shot pots, and add some wooden spoons / stirrers (also purchased on ebay). 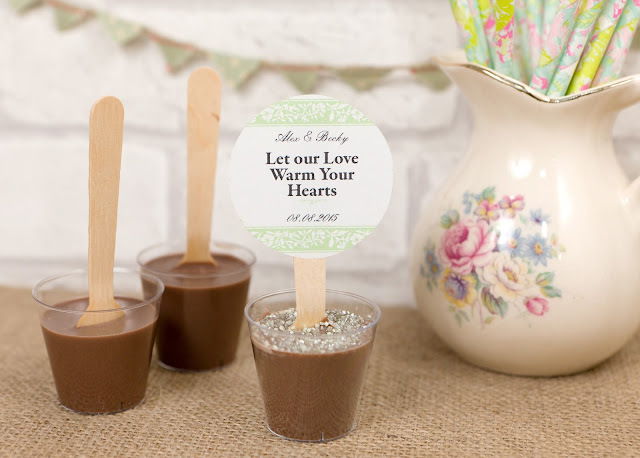 I waited for the chocolate to cool down before I added the wooden spoons. (I only needed to wait 60 seconds). The wooden spoons should stand in the melted chocolate on their own. 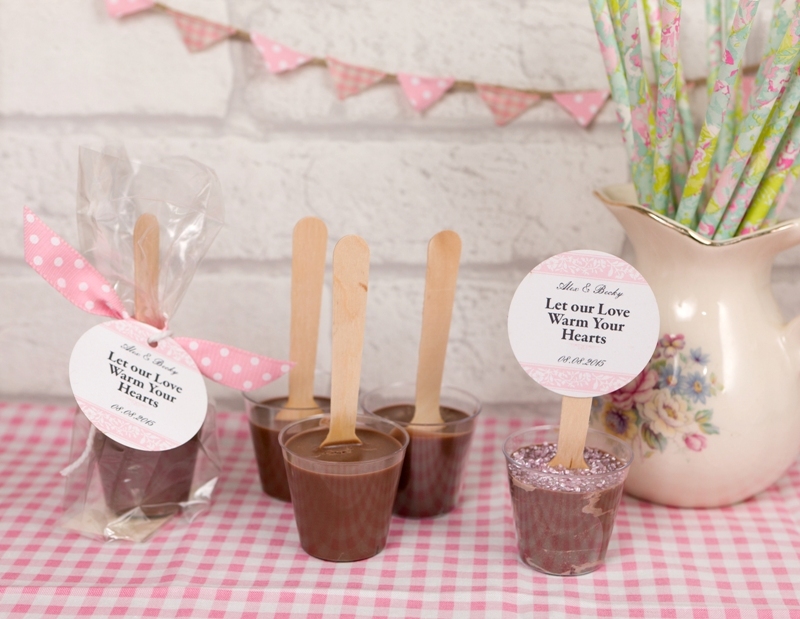 This is what your little hot chocolate pots should look like. 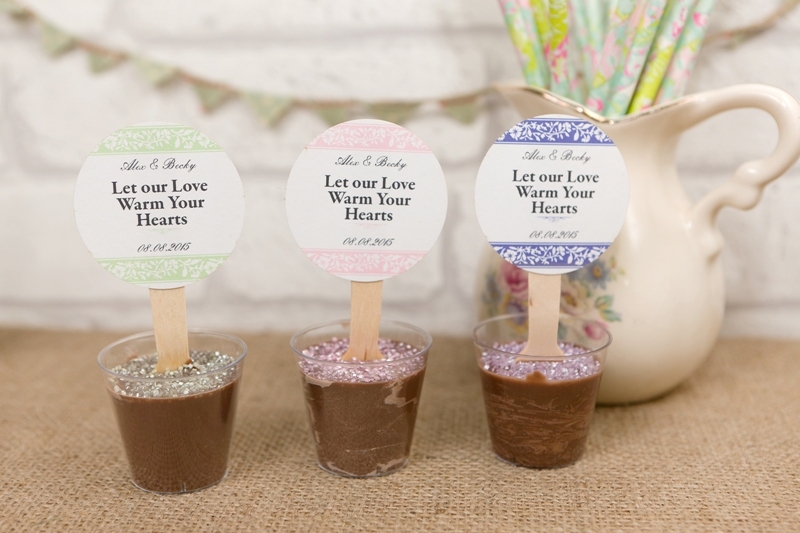 We then decorated the hot chocolate pots with some of our printed 2" tags. 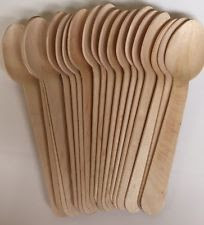 I added 2 tags, and stuck them on the front and the back of the top of the wooden spoon. You can add a few sugar crystals to the top. 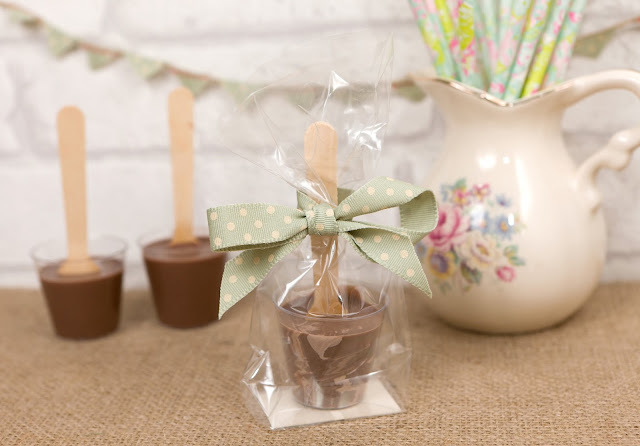 When the chocolate has set, add the hot chocolate pots into a clear cello bag, and add a little pretty ribbon tied into a bow. 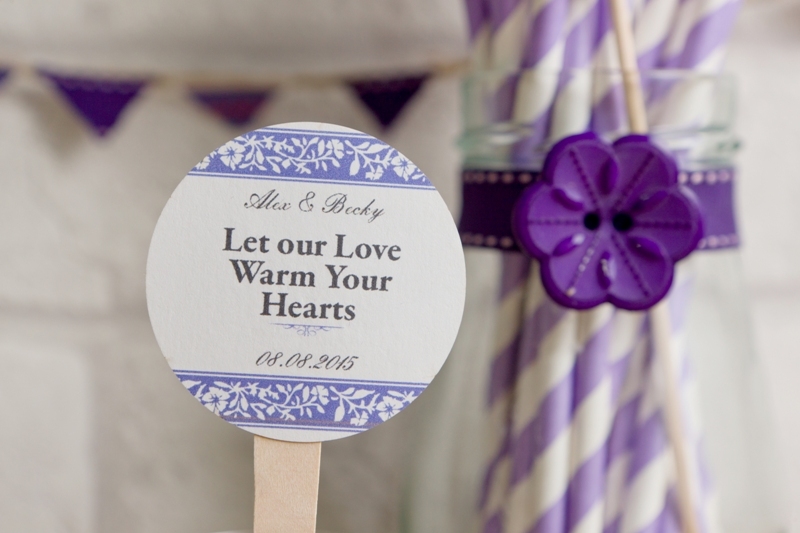 Ours is from a selection of stitched grosgrain ribbon from www.janemeans.com. 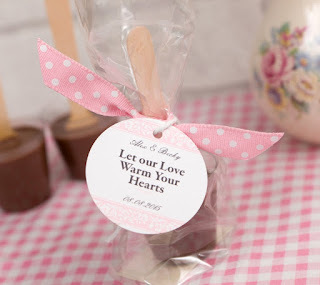 To finish, add the personalised tags if you are adding them into cello bags. We think they make lovely little favours for your wedding guests, and they taste good too! *Items can be purchased by clicking on the highlighted blue wording.